“the ladies” | Animal on Animal. Okay, here’s a bonus one to keep the ball rolling. If you keep sending me stuff I’ll keep the posting at a steady rate, at the moment I’m looking at every Monday and Friday having an update. Please tell your friends and keep sending me your fancy pictures (link over on the right). Today we have the momentous pairing of a mouse and a frog. 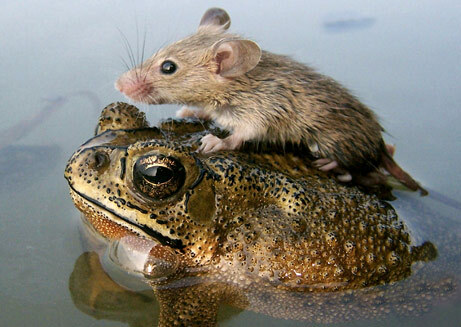 I’d like to think that the mouse is rich, and has paid the frog a large amount of money to chauffeur him around and impress “the ladies”. If I was a lady, I would be impressed. He’s the kind of mouse you’d take home to show the folks. Nabbed from the nice people over at National Geographic.